The English Department is one of Mill Hill’s largest offering a hugely varied programme of teaching throughout the school. The department comprises six full-time and two part-time teachers. The nature of the subject is wonderfully diverse but our principal aim is to teach literacy, this being the state of being able to read, write and communicate, and we regard close reference to English Literature as crucial in this quest. 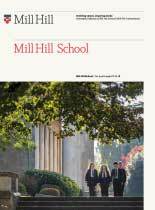 Yet the subject is not confined to the literary – it aims to teach about many aspects of modern communication and Mill Hill pupils are encouraged to develop as speakers/debaters as well as simply learning how to write well or study texts. In the Fourth Form (Year 9) all new pupils undertake a course covering a range of texts and activities, including the study of a Shakespeare play, a variety of poetry, both heritage and contemporary, and at least two novels. Much of the assessment is continuous but there is also a skills-based English Language examination in the summer term. All of this is essential preparation for the GCSE course that follows over the next two years in the Remove and Fifth Form (Years 10 and 11) and which covers, among other things, at least a further four texts. This includes one further Shakespeare play and a range of skills and approaches in the study of English Language. At A Level pupils study English Literature and they follow a two-year course which comprises prose, poetry and drama. These incorporate eight major works from 1300 to the present day. A level course assessment comprises final examination (80%) and coursework (20%). A Level English is a popular choice of subject at Mill Hill and has become increasingly so in recent years. There is also an active English Society that runs a number of activities and events throughout the academic year, including lectures (often led by prominent outside speakers – visiting speakers in recent years have included ex-Poet Laureate Andrew Motion, Dominic Sandbrook and Wendy Cope), theatre trips to the nearby West End, reading, and groups dedicated to reading, creative writing and debating. A popular weekly English society lunchtime meeting is held in the Piper Library at which the writing of established authors and our own pupils is read and discussed.